"In order to adapt and thrive, organizations need leaders who can think strategically and harness each wave of digital change to create new value for customers and new opportunities for their business." Today, every business is a digital business. In every industry, traditional business models and processes are being transformed by the spread of new digital technologies and the rise of disruptive threats. If electricity transformed manufacturing during the Industrial Revolution, the impact of digital technology today is even greater. Digital is changing the constraints under which every business, and every domain of strategy, operates. In order to adapt and thrive, organizations need leaders who can think strategically and harness each wave of digital change to create new value for customers and new opportunities for their business. Columbia Business School’s Digital Business Leadership Program is an intensive, six-month, multi-modular program that prepares global executives to innovate new strategies and business models and lead their organizations to thrive in the digital age. Executives begin the program with an immersion week at Columbia’s New York Campus where the focus will be on the strategic principles of digital business models. While in New York, they will form teams to work on real-world digital innovation projects, applying the Lean LaunchPad method for rapid innovation. This is followed by an online module on digital marketing and remote work on their team projects with online coaching. Participants then go to San Francisco to study new disruptive business models and learn from organizations at the forefront of the digital revolution. This is followed by another online module on digital marketing and remote work on their innovation projects. In the ﬁnal module, participants return to the New York Campus for a week, focusing on organizational leadership and digital transformation. Case studies will feature both digital trailblazers and traditional enterprises that are adapting to the digital age. Participants will leave with a set of planning tools and strategies to apply immediately in their own companies. Program Partner: Eruditus Executive Education is the program partner for Columbia’s Digital Business Leadership program. Prospective participants with questions on the program are encouraged to contact them for further information by email at dblp_columbia@eruditus.com or phone at +91-22-61623112 (India), +97144302011 (Dubai), or +65 68714030 (Singapore). A 25 percent tuition benefit for themselves and up to four colleagues each year for programs lasting up to seven days. Access to Columbia Business School Alumni Career Services resources, including access to unique career content, a job board, an online networking platform, the alumni directory, and more. Download the full list of resources. 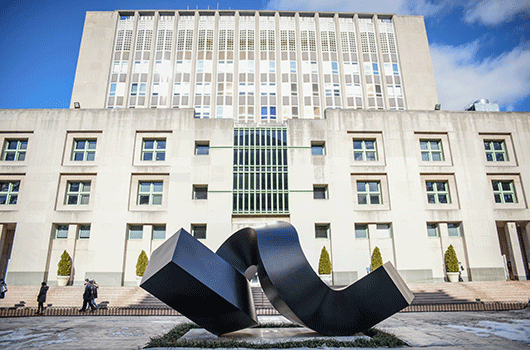 Eligibility to join a Columbia Business School alumni club. View the alumni clubs list. The program is centered around three key topics — digital strategy, rapid innovation, and organizational transformation — and features project work as well as company speakers and visits. For a complete program schedule and curriculum, download the program brochure. Topics and sessions are subject to change. Participants might come from large- or medium-sized ﬁrms who are focused on digital transformation and innovation within existing industries. The Digital Business Leadership Program was a very fulfilling experience and the diversity of the class really helped everyone make the most of it. Through the program I have discovered new tools to showcase some of my strengths. It showed me how I can turn on creative innovation by inspiring others, how to develop a common customer language to approach business challenges, and how to convince others that the digital transformation goes way beyond technology and starts with an individual mindset shift followed by a common cultural change ambition. "The value and knowledge I received from the curriculum and professors have exceeded my expectations. There are many lessons that I have already applied to my work. Needless to say, the network I got to build at the program is also invaluable." David Rogers is a globally-recognized leader on brands and digital business strategy. He has advised startups and global companies on digital strategy, including Visa, SAP, Kohler, Pernod Ricard, Toyota, China Eastern Airlines, and others. He has appeared on CNN, CNBC, Channel News Asia, The Economist, and The Wall Street Journal, in addition to delivering keynotes at conferences worldwide on the ways that technology is transforming brands and business strategy. Rogers is also the founder and host of the Center on Global Brand Leadership's acclaimed BRITE conference on brands, innovation, and technology, where global CEOs and CMOs come together with leading technology firms, media companies, and entrepreneurs, to address the challenges of building strong brands in the digital age. His recent research at the Center has focused on big data, the Internet of Things, in-store mobile shoppers, and data privacy. Rogers is the author of four books, including the forthcoming, The Digital Transformation Playbook: Rethink Your Business to Adapt and Thrive in the Digital Age. Along with the above listed faculty, additional Columbia Business School faculty may contribute to and teach in the program. Admitted participants will have to pay 10 percent of the fee within 10 days of their admission to conﬁrm their seat. Please note that if a candidate is admitted and accepts the admission, the application fee is adjusted with the program fee payable. Please note that admissions to the program are on a rolling basis. We strongly recommend interested participants apply early. The ﬁrst module of the program takes place in the United States. For those applicants who need a visa to travel to the US, it is recommended you apply by the early application deadline to allow sufﬁcient time for your visa processing formalities.